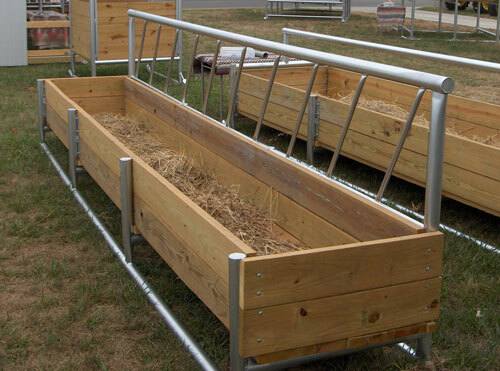 The FH-216 Bunk Feeder is a combination hay and feed fence line bunk feeder is designed to hold hay and feed. The stanchion bars are welded 14″ apart to limit head movement, thus saving hay. The main frame is welded into a solid unit from heavy wall 2 1/2″ O.D. steel pipe along with 2″ x 8″ grade #1 treated lumber bolted on. The feeder measures 50″ from the ground to the top. Measures 25″ to the top of the side board. Available in: 8′ / 12′ / 16′ lengths x 35″ wide x 16″ deep.